Kayseri 4th High Penal Court sentenced four lawyers who are the members of Kayseri Bar Association ranging from 6 years and 3 months to 8 years and 9 months imprisonment. 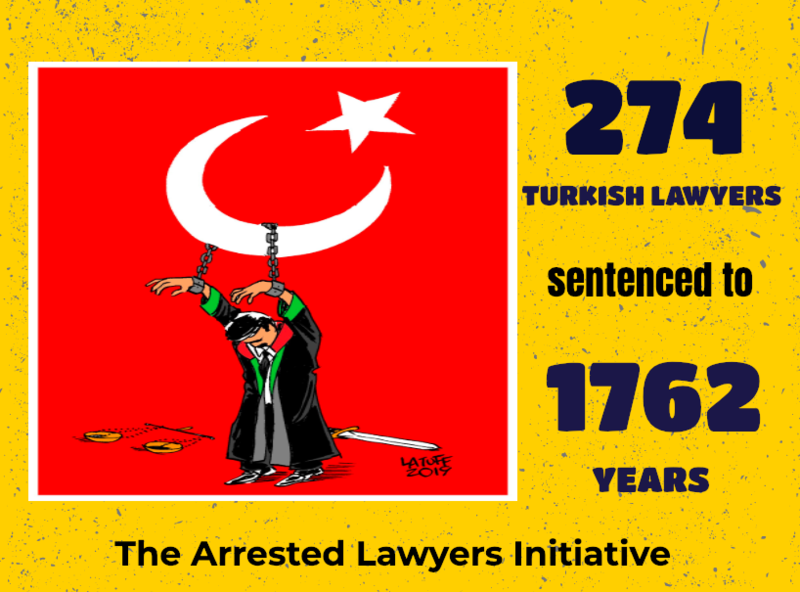 Lawyers Bekir Sıddık Çelik, Oğuz Holat and Hakan Özbek were sentenced to 6 years and three months, and Ahmet Kemal Göncü was sentenced to 8 years and nine months with the charge of being the member of the armed terrorist organisation. Previously, Kayseri 4th High Penal Court sentenced lawyers Hilmi Ş and Hacı Hasan, Nejla BK and Mutlu K to 6 years 3 months prison sentence with the charge to be the member of the armed terrorist organization only for allegedly downloading the Bylock i-message app. So far, eight members of Kayseri Bar Association have been sentenced to prison term with the charge of being the member of the armed terrorist organisation and a total of 33 lawyers have been under prosecution in the province of Kayseri. Lawyer Serkan Ulufer who was the president of Adana Nizam Lawyers Association that was shut down with the Decree Law 667, was sentenced to 9 years in prison by Adana 11th High Penal Court. Lawyer SU was sentenced to 9 years in prison due to being member of a lawyers society that was shut down under emergency rule. So far, seven members of Adana Bar Association have been sentenced to prison term with the charge of being the member of the armed terrorist organisation and a total of 33 lawyers have been under prosecution in the province of Adana. Lawyer Mustafa B, Osman K and Mikail Ü who have been under pre-trial detention for more than a year, sentenced to respectively 6 years and 9 months, 6 years and 3 months and 6 years and 9 months by the first circuit of Kırıkkale High Penal Court on February 1, 2018. The lawyers were convicted of being the member of the armed terrorist organisation because of allegedly using or downloading i-message app named Bylock. #TodayInCrackdown #Turkey#Kırıkkale 1st High Penal Court #sentenced 3 #lawyers 6 years & 9 months imprisonment because of allegedly using #Bylock app. Lawyer Emre Aksoy who is the member of Zonguldak Bar Association, was arrested with the charge to be the member of the armed terrorist organization only for allegedly downloading the Bylock i-message app.